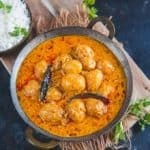 Kashmiri Dum Aloo is a very famous Kashmiri recipe made using baby potatoes simmered in a yogurt based gravy flavored with dry ginger powder and fennel. Here is how to make Kashmiri Dum Aloo in traditional Kashmiri Style. Tired of eating same old potato sabzi every time? Folks, give Kashmiri Dum Aloo a try then! It is also known as Kashmiri Shahi Potato Curry and is simply prepared using baby potato and spices like chilli powder, cumin powder, fennel seed powder, ginger garlic, cardamom powder. Kashmiri Dum Aloo is a very famous Kashmiri Curry. I am almost always disappointed after ordering this dish in a restaurant as what is presented is nowhere close to the authentic preparation. 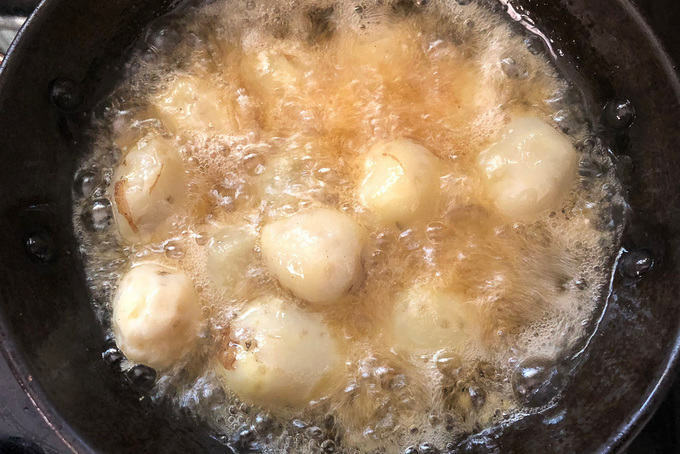 It is rather baby potatoes in a masala gravy or sometimes in a creamy and sweet gravy. I am not denying that they don’t taste good. they taste amazing, but they are not the Kashmiri version. If you are looking for a Restaurant Style Dum Aloo Recipe, you can check it out here. During our stay in Almora for a year, I made this friend whose mom was from Kashmir. During one of the visits to her home, she made this Kashmiri dum aloo for the lunch and I still have that taste on my tongue. Although I never cooked at that time, I just scribbled the recipe on a piece of paper and gave it to my mom, after which she started to cook this dish pretty often. 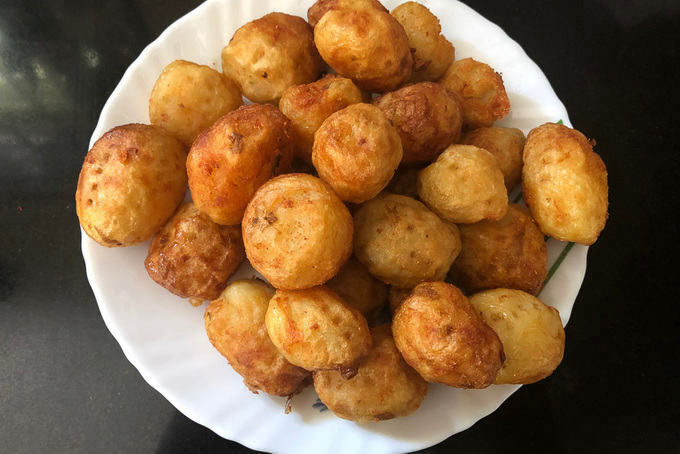 How to make Authentic Kashmiri Aloo Dum? 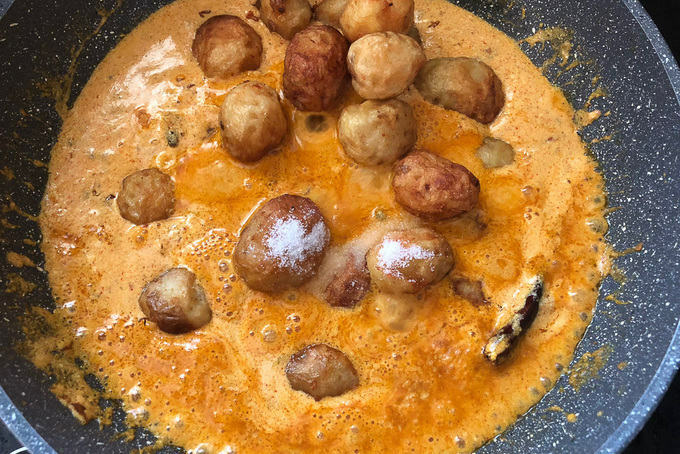 Kashmiri Dum Aloo is made by frying potatoes until they are golden brown and crisp and then simmering them in a yogurt based gravy. 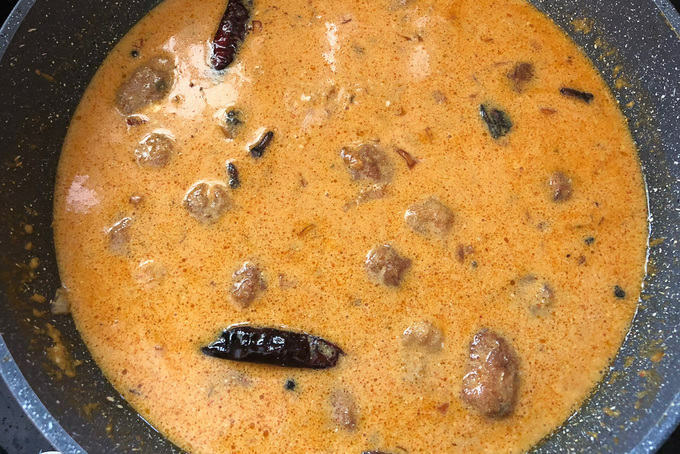 The gravy is flavoured with dry ginger powder and fennel, which are the essential ingredients in Kashmiri cooking. Some people do not add onion in Dum Aloo and you can totally skip it too. 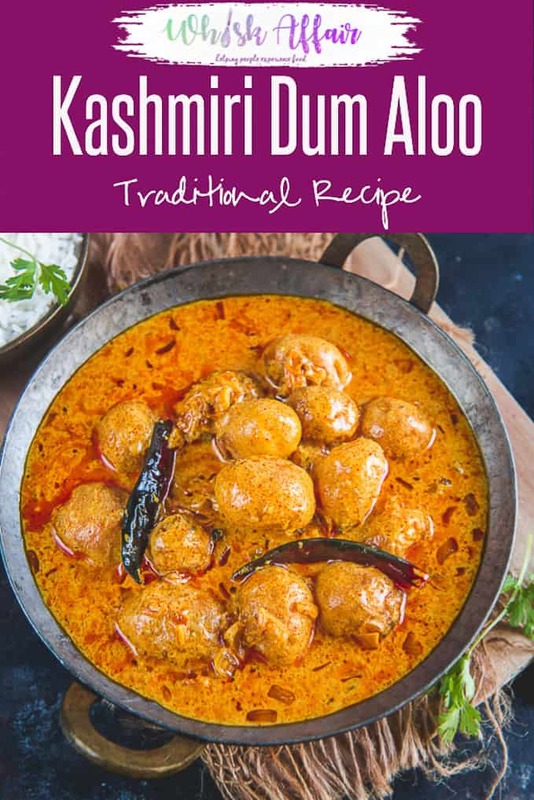 What to serve with Kashmiri Dum Aloo? Serve this superb sabzi with Naan, rotis or any other flatbread of your choice. Trust me, it would taste finger-licking. It goes well with steamed rice too. Wash the baby potatoes and prick them with a tooth pick all around. This will make sure the salt and masala seeps inside them and they are not bland from inside. 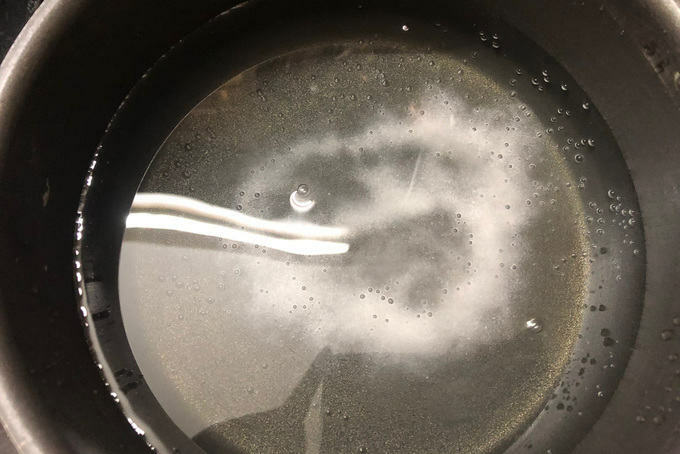 Heat water in a pan. Add 1 tbsp salt in it. 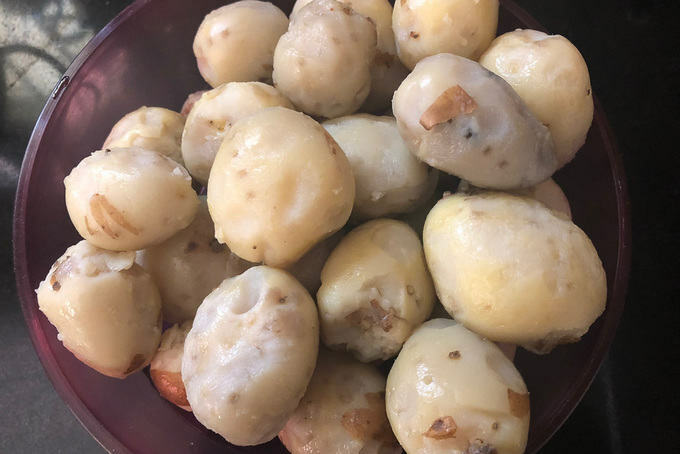 When it comes to a boil, add the potatoes and boil them till tender. 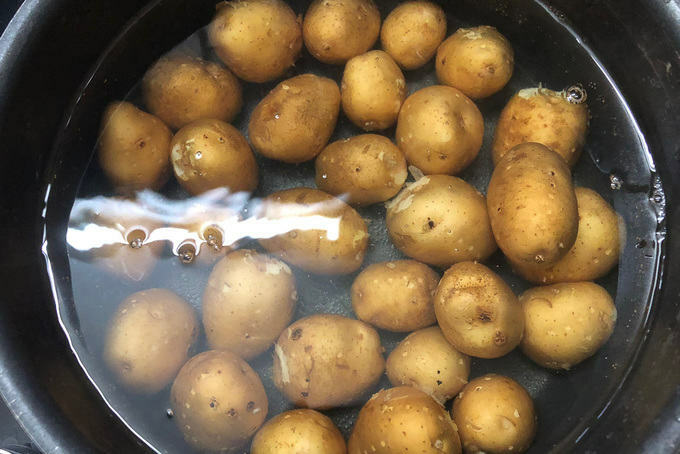 Drain the water and peel the skin of the potatoes. Deep fry the potatoes till golden brown. You can fry these on high heat. Remove them from oil and keep aside. 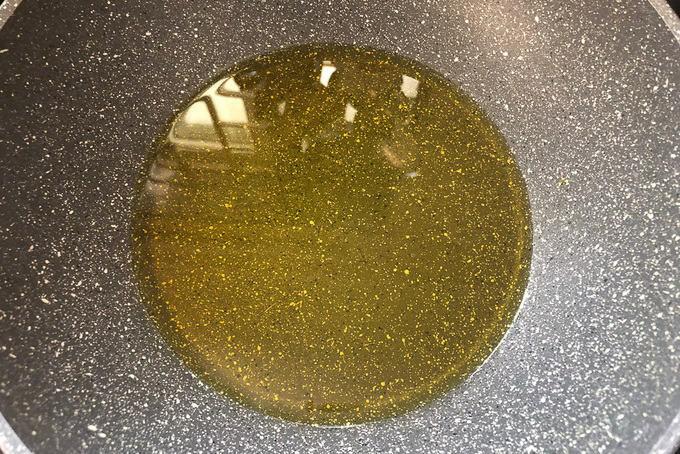 Heat mustard oil in a heavy bottom pan. When it starts to fume, simmer the heat. Add Kashmiri dry red chilies, cloves, black cardamom, green cardamom and peppercorns and fry for a few seconds. Add onions (Optional) and fry till golden brown. 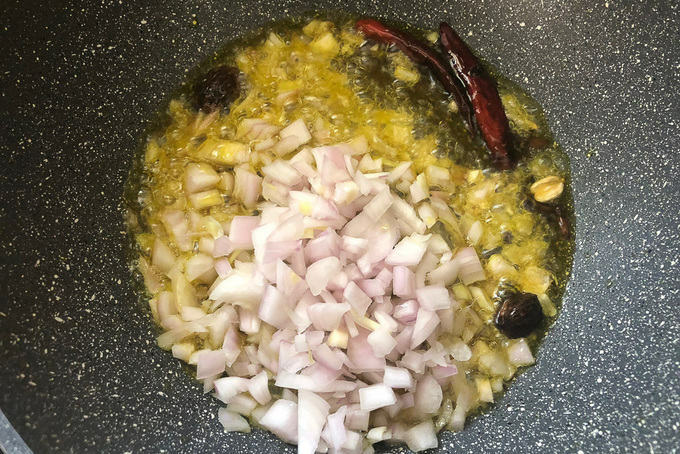 Kashmiri Pandits do not use onion and garlic in their cooking while muslims do. Whisk yogurt, Kashmiri red chilli powder, turmeric powder, dry ginger powder, garam masala powder, fennel powder and all purpose flour in a bowl. I always add flour in yogurt based gravies as it avoid to split the yogurt while cooking. Pour the yogurt mixture in the pan and keep whisking while pouring. Cook until the mixture comes to a boil. Add the potatoes, salt and 2 cups of water. Cover the pan with a tight fitting lid and simmer the heat to minimum. Cook for 10-12 minutes on low heat. 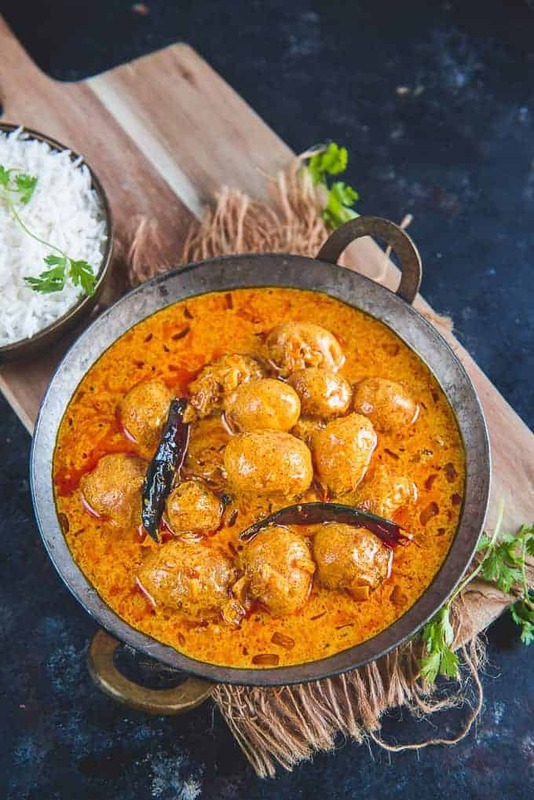 Kashmiri dum aloo is a very famous Kashmiri recipe made using baby potatoes simmered in a yogurt based gravy flavored with dry ginger powder and fennel. 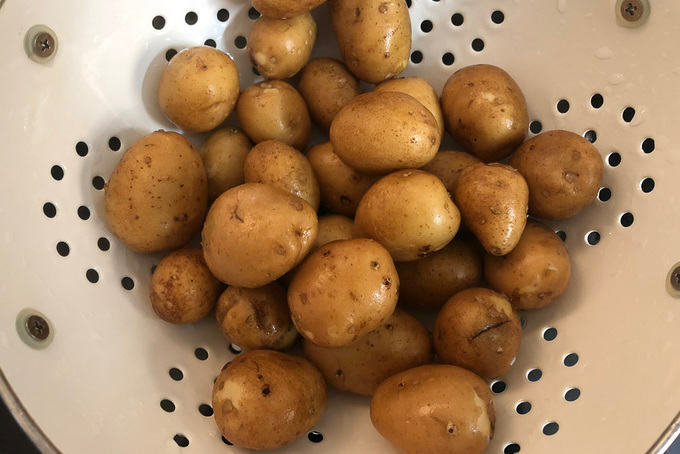 Wash the baby potatoes and prick them with a tooth pick all around. Add 1 tbsp salt in it. Deep fry the potatoes till golden brown. Remove them from oil and keep aside. When it starts to fume, simmer the heat. 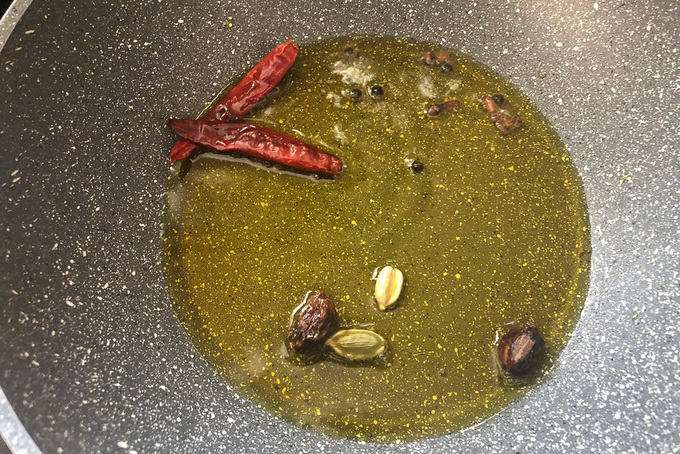 Add Kashmiri dry red chilies, cloves, black cardamom, green cardamom and peppercorns and fry for a few seconds. 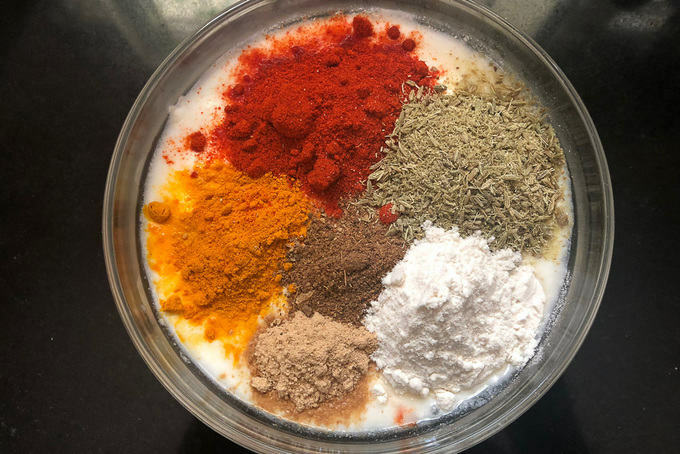 Whisk yogurt, Kashmiri red chilli powder, turmeric powder, dry ginger powder, garam masala powder, fennel powder and all purpose flour in a bowl. Pour the yogurt mixture in the pan and keep whisking while pouring. Cook until the mixture comes to a boil. 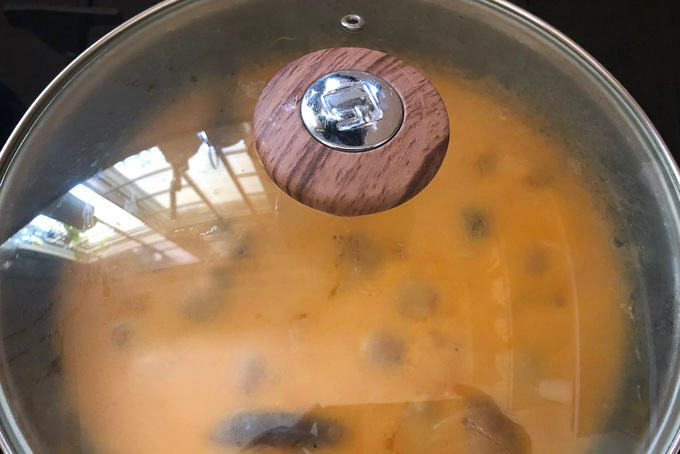 Cover the pan with a tight fitting lid and simmer the heat to minimum. Cook for 10-12 minutes on low heat. Hi Neha, u have a very beautiful blog. Your pictures are just awesome. The way you stage your food is outstandingly good. Did you learn it somewhere or it just the hobby? Even the dishes and the stuff u have is very nice. Little curious to know, hope u don’t mind answer it. Hey Bhawana. Thnx for the appreciation. I learned photography on my own. No professional training. Just kept experimenting with different modes in the camera. Dishes I collect from where ever I go. Whatever good stuff I see, I buy it. Hope this will help.